(1) Bravo to Jonathan Karl for really pressing on these points. He forced Carney to produce spin that is not at all credible, for reasons I'll address below. Today also represents something of a vindication for Karl, whose previous accurate reporting on Benghazi has been assailed by the administration as false. Mediaite's Noah Rothman has the background on that, but the bottom line is that Karl and former CBS News reporter Sharyl Attkisson were correct all along: The White House did, indeed, play a role in shaping Susan Rice's deeply misleading Benghazi talking points, and they lied about it. Carney himself once claimed that the only change the White House or State Department made to her talking points was a single cosmetic revision. For the umpteenth time, that has been exposed as a lie. 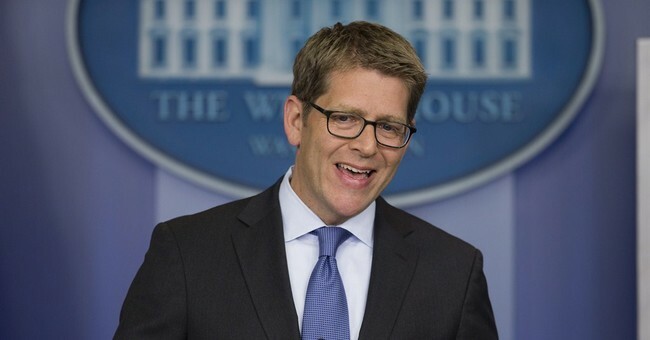 True to form, Carney treated Karl with sneering contempt throughout the exchange, at one point intimating that the journalist was too jet-lagged to ask coherent questions. Question: “They actually told you it was the video? Both Secretary of State Clinton and the president told you it was the videotape?" Carney insists that Rhodes email wasn't about Benghazi, and thus the White House wasn't involved in crafting false talking points. But the Rhodes email fantasy that the attacks "were rooted in an internet video" were also embraced by -- and perhaps even conceived by -- the people at the very top of the food chain, entirely within the context of explaining what happened in Benghazi. "This document was not about Benghazi."